What Does Accreditation Mean to Students? If someone asked you if the institution you are taking a course from is accredited, what would you say? What does accreditation mean to you as a student? 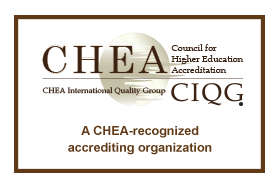 According to the Council for Higher Education Accreditation (CHEA), accreditation is a means to ensure and improve higher education quality. Accreditation is a process that gives public recognition to institutions that meet certain standards. It is a promise that an institution will provide the quality of education it claims to offer. Accreditation assures the student that the institution operates on a sound financial basis, has an approved program of study, qualified instructors, adequate facilities and equipment, and approved recruitment and admissions policies. Academic programs, especially graduate programs, require that applicants demonstrate sufficient academic background to warrant admission, and therefore tend to prefer students who graduated from accredited programs over other students.